The ZHEN Hammered Surface Damascus Nakiri Knife Blanks are made with super sharp VG-10 Japanese stainless steel knife that is made with 66-layer Damascus steel to increase toughness, improve rust & stain resistance, and prolong knife life. The Beautiful Hammered Texture & Forged Damascus blade to help prevent food from sticking on knife body. The perfect weight balanced 3-pin design full length knife blade kit comes pins for connecting handle to the blank, you can DIY your own handle with your favorite woods. The HRC 60-62 hardness blade for exceptional sharpness, edge retention and durability. Long-lasting sharp edge perfectly designed in delicate vegetable chores. The curvature in the blade allows for a smooth rocking action. The Santoku Chopping Knife is designed for all chefs from professionals to home chefs and makes a excellent addition to any kitchen. The blade length is approximately 6-5/16" x 5/64" thick with an overall length of 11-1/2". Full tang 3-pin design knife kits handle with well balanced construction. 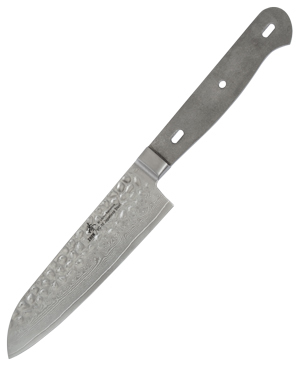 The ZHEN Hammered Surface Damascus Small Santoku Knife Blank are super sharp VG-10 Japanese stainless steel knifes are made with 66-layer Damascus steel to increase toughness, improve rust & stain resistance, and prolong knife life. 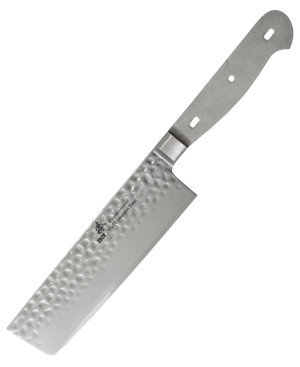 The Beautiful Hammered Texture & Forged Damascus blade to help prevent food from sticking on knife body. The perfect weight balanced 3-pin design full length knife blade kit comes pins for connecting handle to the blank, you can DIY your own handle with your favorite woods. The HRC 60-62 hardness blade for exceptional sharpness, edge retention and durability. Long-lasting sharp edge perfectly designed for dicing, slicing, and chopping fresh produce or even carving. The Santoku Chopping Knife is designed for all chefs from professionals to home chefs and makes a excellent addition to any kitchen. The blade length is approximately 4-3/4" x 5/64" thick with an overall length of 9-1/4". The ZHEN Hammered Surface Damascus Large Santoku Knife Blanks are super sharp VG-10 Japanese stainless steel knifes are made with 66-layer Damascus steel dragon to increase toughness, improve rust & stain resistance, and prolong knife life. 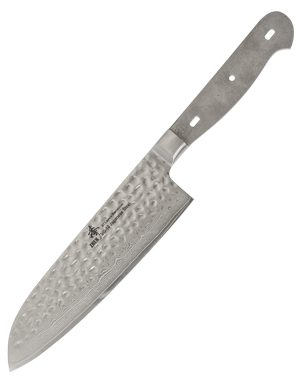 The Beautiful Hammered Texture & Forged Damascus blade to help prevent food from sticking on knife body. The perfect weight balanced 3-pin design full length knife blade kit comes pins for connecting handle to the blank, you can DIY your own handle with your favorite woods. The HRC 60-62 hardness blade for exceptional sharpness, edge retention and durability. Long-lasting sharp edge perfectly designed for dicing, slicing, and chopping fresh produce or even carving a roast chicken. The Santoku Chopping Knife is designed for all chefs from professionals to home chefs and makes a excellent addition to any kitchen. The blade length is approximately 6-1/2" x 5/64" thick with an overall length of 11-3/4"
The ZHEN Damascus Santoka Chopping Knife Blanks are made by welding 66 layers of steel together around a core layer of VG – 10 steel (HRC60-62) creating a high quality blade with a keen edge and very unique, beautiful pattern. These layers wear at a slightly different rate, causing a very fine micro-serration which produces an edge which is extremely sharp and will hold its edge for a longer period of time. The Damascus Santoka Chopping Knife Blank has a deep belly that is made for dicing, slicing, and chopping. The curvature in the blade allows for a smooth rocking action. The Santoku Chopping Knife is designed for all chefs from professionals to home chefs and makes a excellent addition to any kitchen. 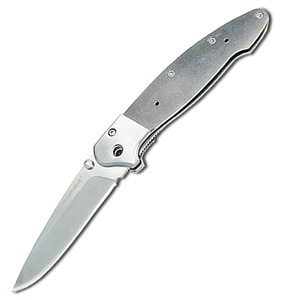 The blade length is approximately 6-3/4" x 5/64" thick with an overall length of 11-15/16". 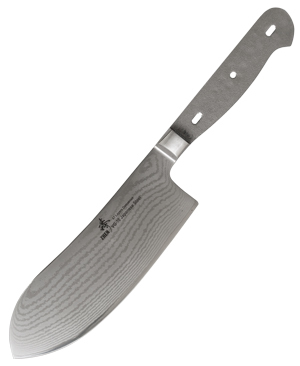 The ZHEN AUS-10 3-Layer Santoku Chopping Knife Blank are made of 3 layers forged steel. The core layer of AUS-10 Steel (HRC59-61) is clad with 2 layers of AUS-10 steel one on each side. It creates a super sharp blade which holds an edge longer than normal knives. 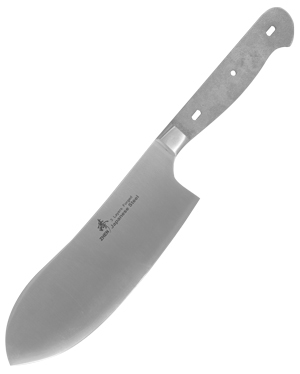 The Santoku Chopping Knife Chopping Knife Blank has a deep belly that is made for dicing, slicing, and chopping. The curvature in the blade allows for a smooth rocking action. The Santoku Chopping Knife is designed for all chefs from professionals to home chefs and makes a excellent addition to any kitchen. 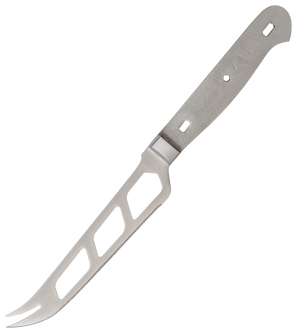 The blade length is approximately 6-3/4" x 1/16" thick with an overall length of 11-15/16"
The ZHEN High Carbon Steel Cheese Knife Blank is made from Japanese high carbon stainless steel (HRC54-55) that increases its durability and prolongs the life of the knife, while improving its stain resistance. The blade edge is extremely sharp and has two sharpened fork ends that allow you to pick up cheese or meat after cutting making it perfect for cheese and meat trays at any party or family functions. The blade also has open cavities to help prevent foods from sticking. 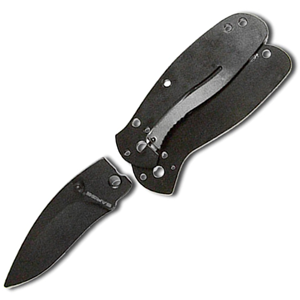 The blade length is approximately 4-3/4" x 1/16" thick with an overall length of 9-1/4". Build your own folding knife in a few hours using our custom knife kit. Only minimal tooling is required as our kit comes with 2" 440 stainless steel blade, liners, fasteners, spacers, washers and Allen wrenches. Add your personalized handle-design to a SARGE high-performance blade. Build your own knife in a few hours with our semi-skinner custom knife kit. 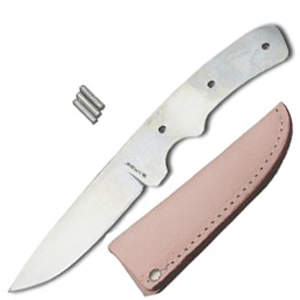 Comes with 3 1/8" blade and pre-drilled tang for a 7-1/4" overall length. Only minimal tooling and a few hours of your time is required. Complete assembly instructions and custom-fitted leather sheath included. 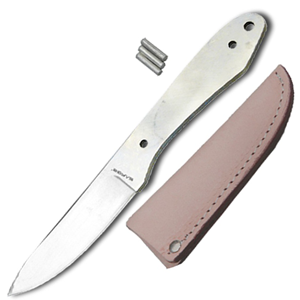 These knife kits are constructed from 1/8" 440C Stainless Steel with a hollow ground and highly polished blade section. Just shape, mount and finish your custom handles for a one of a kind, high quality knife kit. When creating a set of the beautiful ZHEN Premium Damascus Knives from our kits, you will need to drill and counterbore for the provided rivets. 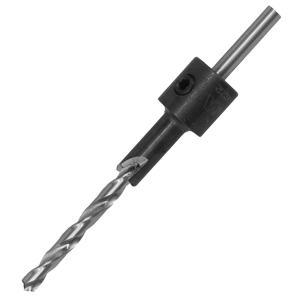 Whiteside has created the tool needed to bore and countersink the rivets needed to complete these kits. The depth of bore will be dependent on the thickness of your scale material.